Mango season is still on. So why not try some delicious kind of mango recipes? 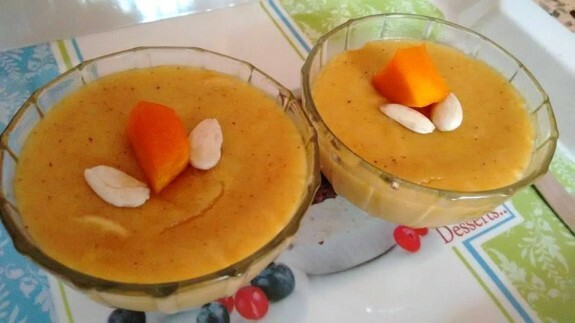 In this season, I tried different types of amazing mango recipes including Mango Salsa, Mango ice- cream, Mango Kulfi, Mango Raita and many more. So, this, time I prepare Mango Sheera or Mango Sooji Halwa which is really yummy and tasty to have. The flavours of Sheera can be versatile as you can use any type of seasonal fruit in it. 1. Cut Mango into pieces and reserve 2 Tbsp chopped mango from that. Now, grind the rest of the mango pieces to a smooth puree and keep it aside. It should be minimum ½ cup pulp. 2. Now, take a bowl and add 1 Tbsp warm milk and add saffron to it. Keep it aside for approximately 10 mins. 3. Heat 2-3 Tbsp ghee and add rava and fry them until a good aroma comes and rava becomes light brown in colour. Stir it continuously and don’t roast it too much so that we don’t need deeper brown colour of sooji. 4. Now, add the boiling water to the roasted rava and mix it properly. If you want your can cover it for 1-2 mins to cook it. You can add more water if you think. 5. Now, add sugar in to the rava and mix it well. Cook it another 1 min until rava absorbs the water. 6. Now, add the milk and mix again. Cook for a minute. Now, the halwa becomes slightly dry. 7. Add the mango puree to it and mix well. Now, the halwa becomes bit loose in consistency. 8. Add cardamom powder, saffrom mixed milk, cashew nuts, raisins and 2-3 Tbsp ghee and mix everything well. Let it cook for 2 mins on low flame until halwa becomes thick. 9. Switch off the flame and keep it for 5 mins. 10. Garnish it with chopped mango and almond.